Der ORF war da! 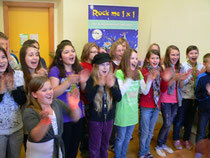 - Rock me 1x1 - wer nicht rechnen will, soll singen! Heute nachmittag ging's im KLEX in der Marschallgasse rund: Dorian Steidl interviewte Lehrerinnen, SchülerInnen, einen Kinderpsychologen und die Produzentin Andrea Klein zum Thema Rock me 1x1. Als die 1a und 1b Klasse das Lied "Count on singing" anstimmten, bebten die Mauern: klatschen, stampfen, singen - alles prima Hirntraining! There's definately a lot to know about this subject. I love all of the points you have made. Hi would you mind sharing which blog platform you're using? I'm looking to start my own blog in the near future but I'm having a difficult time choosing between BlogEngine/Wordpress/B2evolution and Drupal. The reason I ask is because your layout seems different then most blogs and I'm looking for something unique. P.S My apologies for being off-topic but I had to ask! Thank you for the good writeup. It actually was once a leisure account it. Glance advanced to far brought agreeable from you! However, how could we be in contact? For most up-to-date news you have to pay a visit world-wide-web and on the web I found this web site as a finest website for newest updates. Fantastic website. A lot of useful info here. I'm sending it to a few buddies ans also sharing in delicious. And of course, thank you in your sweat! I have been exploring for a bit for any high quality articles or blog posts on this sort of house . Exploring in Yahoo I at last stumbled upon this web site. Reading this information So i am happy to exhibit that I have an incredibly just right uncanny feeling I discovered just what I needed. I so much for sure will make sure to do not put out of your mind this website and provides it a glance regularly. hello there and thank you for your information � I've definitely picked up something new from right here. I did however expertise a few technical points using this website, as I experienced to reload the site lots of times previous to I could get it to load properly. I had been wondering if your web hosting is OK? Not that I am complaining, but sluggish loading instances times will often affect your placement in google and could damage your quality score if advertising and marketing with Adwords. Well I'm adding this RSS to my e-mail and can look out for a lot more of your respective exciting content. Make sure you update this again very soon. Good day! Do you know if they make any plugins to help with SEO? I'm trying to get my blog to rank for some targeted keywords but I'm not seeing very good success. If you know of any please share. Many thanks! 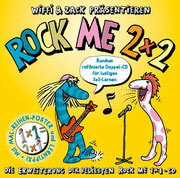 Psst - die Erweiterungs-CD ist soeben erschienen: Die Doppel-CD "Rock me 2x2" für alle, die noch mehr wollen! Mit Malreihen-Poster und Lerntipps. Kinder lieben sie. Mit Marion Petric, der Ö3- Stimmenimitatorin! hier gehts zu den Hörproben. "Gratulation - Im Sinne des gehirngerechten Lernens Mathematik mit Singen zu verbinden ist [...] eine lustvolle und sehr zielführende Möglichkeit des Lernens und vor allem der Wissenspeicherung." dafür fand die die CD breiten Konsens und wird als empfehlens- werte Erweiterung des Lernangebots empfunden." neue Videos von der Zaubershow! Probesong gratis downloaden: für einmaligen newsletter anmelden, dann kommt das Zugangspasswort!